HomeBusinessThe Next Big Emerging Markets? Now The Economist is getting into the game with “CIVETS”: Colombia, Indonesia, Vietnam, Egypt, Turkey and South Africa – six countries that could be the next wave of emerging markets stardom. Start with Colombia, which has had a hard time getting people to forget about its narcoterrorism past and look at its promising pro-business government policies. Turkey’s economy is dynamic and currently supported by strong underlying trends that point to long-term growth ahead. Its economy is the sixth largest in Europe and in the top 20 worldwide with a 2009 GDP of $615 billion. Turkey’s per capita GDP of just over $8,700 is greater than any of the BRICs. Industrial output leaped by 21 percent in the 12 months ending March 2010, inflation fell to 6.1 percent last year from double-digit levels a year before, and public debt is less than 40 percent of GDP. And while Europe still makes up more than half of Turkey’s exports, the current government has taken steps to increase exports to Middle East trading partners – Saudi Arabia, Iraq and Egypt – as a hedge against economic volatility in Europe. Indonesia’s demographics, natural resources and relatively stable politics have set up the country for what could be a very strong decade of growth. Its economy doubled in the past five years and in greater Jakarta – the world’s second-largest urban area with roughly 23 million people – per-capita GDP grew by 11 percent each year from 2006 through 2009. More importantly, this growth was driven by the private sector, not by government spending – the private sector accounts for roughly 90 percent of the country’s GDP. Over the past five years, the average income has doubled to $2,350 a year and Deutsche Bank thinks that figure can rise another 50 percent by the end of next year. Beyond the CIVETS, we see some potential in other places. Malaysia’s economy, for instance, grew more than 10 percent in the first quarter of 2010, and the country has plans to slash its budget deficit and at the same time invest more heavily in infrastructure. And in Chile, despite February’s earthquake, public debt is just 7 percent of GDP and the economy is expected to see 5.5 percent growth this year and 6.5 percent in 2011 as resource exports to emerging markets in Asia accelerate. We see the global growth story – led by key emerging market countries like the BRICs, the CIVETS and others – as the most powerful long-term investment opportunity. 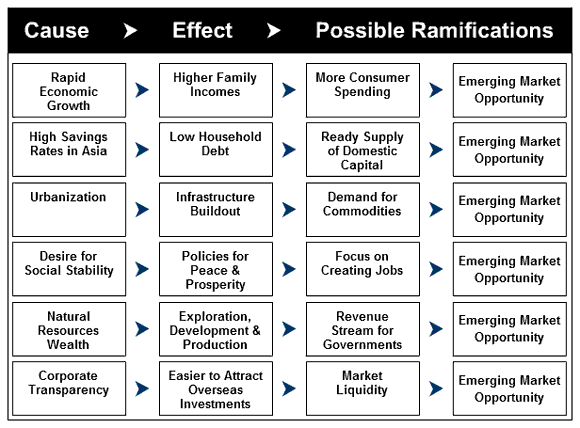 For more on this theme, I invite you to visit our website to read through the Emerging Markets archives on the “Frank Talk” blog and to look at our interactive “What’s Driving Emerging Markets” presentation. Is the Turkey ETF a Great Emerging Market, or Just the Best of Europe? 4 Comments on The Next Big Emerging Markets? Sorry sir , but I object to the use of the acronym PIIGs which is to say the least insulting. Besides, if you insist in using it then you should add another term to the list: TOXIC APES, meaning Anglo Protestant Economies adept at spreading toxic financial waste, particularly the UK and the US. But if the author insist in using PIGS then the answer is that the author is a bigger PIG. The use of the term PIGS by an anglosaxon author,whose country is at the origin of this mess is just a joke. Besides, countries like Italy or Spain are included in that derogatory term by this anglo neonazis. Well, Italy and Spain are the seventh and ninth world largest economies and frankly speaking, trying to compare them unfavorably with the likes of Colombia or Indonesia or Vietnam is just one of the most stupid things I have ever heard. Those anglo big mouths should feel a bit shy about insulting other people when they are at the cause of this crisis. TOXIC APES is just great, let us spread the word. PIIGS. European nations with large public debt burdens. I guess the author is nor referring to Spain, whose public debt is just 57%. As a comparison, the UK, Germany, France, Austria, Sweden and others are well above 70%, and not to talk about the US…I guess they are all very big PIGS….unless of course the author is a racist with a bent towards insulting Southern Mediterraneans because they are not blonde like the other guys. What a shame.